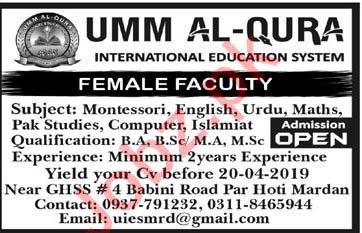 Umm Al Qura Private Institute is looking for experienced and energetic candidates for the posts of Montessori Teacher, English Teacher, Urdu Teacher, Maths Teacher, Pak Studies Teacher, Computer Teacher, Islamiat Teacher in Mardan. Interested candidates can contact on given details for more information. You can apply online at vacancy after registering at http://www.jobz.pk site.